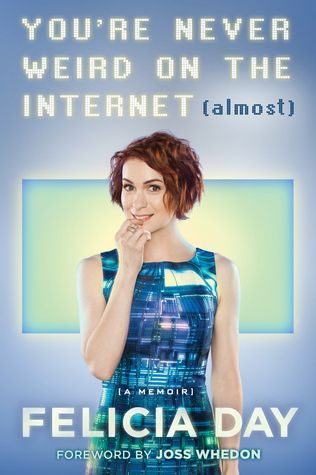 The blurb: From online entertainment mogul, actress, and “queen of the geeks” Felicia Day, a funny, quirky, and inspiring memoir about her unusual upbringing, her rise to Internet-stardom, and embracing her individuality to find success in Hollywood. The Internet isn’t all cat videos. There’s also Felicia Day—violinist, filmmaker, Internet entrepreneur, compulsive gamer, hoagie specialist, and former lonely homeschooled girl who overcame her isolated childhood to become the ruler of a new world… or at least semi-influential in the world of Internet Geeks and Goodreads book clubs. After growing up in the south where she was “home-schooled for hippie reasons”, Felicia moved to Hollywood to pursue her dream of becoming an actress and was immediately typecast as a crazy cat-lady secretary. But Felicia’s misadventures in Hollywood led her to produce her own web series, own her own production company, and become an Internet star. What did I think? This isn’t the type of book I would normally read but I read it for International Geek Girls Penpals Club Bookworms February 2016 Book Of The Month. And I’m really glad I did because I thoroughly enjoyed it. I first found out about Felicia Day when I she started guest-starring on Supernatural and didn’t really know much else about her other than that she’s a really big geek. Her memoir is an honest insight into all the wacky and wonderful that has made her the person she is today. From her unconventional upbringing that allowed her to be as weird as she wanted to be, as she was homeschooled and didn’t face the same social pressure kids and teenagers generally do to fit in, to her struggles as an aspiring actress in Hollywood with a seemingly useless double degree in math and music. And from developing a serious World of Warcraft addiction, right down to using the knowledge she gained spending all those hours lost in a fantasy world to create something that startkicked her career in the geekverse. She wrote The Guild, which focuses on a group of people playing a similar game to WoW and was too niche at the time to be picked up by an established television network, but it was perfect for the Internet; the web series was born. It is not an easy road though and Felicia doesn’t gloss over the more difficult parts of her life, which makes this not only an incredibly relatable read for those of us who have grown up with the internet, but also genuinely inspiring and insightful for both existing fans of and those who picked up the memoir because they’re interested in one of the TV-shows Felicia has been a part of or the change the Internet has brought to the world; it has fundamentally changed the way we communicate with each other. Forming relationships with someone on the other side of a screen can be both a blessing and a curse at times. Yes, it has become easier to find like-minded people anywhere in the world that we feel that connection with, but it has also become so much easier for the human race to let their worst side flourish, hiding behind the safety of fake personas and made-up screen names – and Felicia has faced some of the worst examples of this herself. Many of Felicia’s stories resonated with me. I may not have grown up becoming as invested in video games as her but I had similar experiences online. I vividly remember the feeling of wonder at having the world at my fingertips and losing hours – sometimes days – when completely engrossed in something on the Internet, usually Youtube or Tumblr. It was interesting to read about how ‘back in the day’ it was the rare excitement of connecting with someone who was as much into a barely known fandom as you were and using existing characters in role-playing games or fan fiction that made those hours disappear. You’re Never Weird on the Internet (Almost) is an insightful and honest memoir about one woman’s journey of growing up and finding her place in the world, both online and offline. Felicia’s witty and self-aware humour shines through on every page, even the ones detailing low points in her life. She does so unashamed of being different, instead highlighting that she is proud of the quirks that make her unique and, well, her. We could all do with some reassurance every now and again that it is okay to completely be yourself, whatever shape or form this may take (as long as you don’t hurt someone by doing so), and this book provides just that, while at the same time being an incredibly funny and fascinating read that was just addictive as the Internet itself can be.